‘Avengers Assemble!’ The iconic catchphrase of our favourite superhero movie is something we look forward to, not because it is followed by cool flashy explosions and actions, but because we get to see the Marvel characters save the world at the end. Yet if we look hard enough in our daily lives, it isn’t hard to find heroes within our midst as well – the friendly electrician who saves us from the darkness when the power trips, the mechanic who patches up our cars in a jiffy when it breaks down, or even the helpful locksmith who opens our doors when we leave the keys at home (again). But if we were to compare these daily heroes to our ideal Marvel heroes, who would they be? There’s nothing like a good relaxing bath at the end of the day, but having a burst water pipe is not the kind of shower you would want to have at home. Luckily, your friendly plumber is here to help! 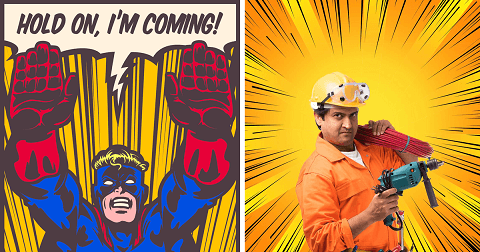 If you are covered under Emergency Home Assistance (EHA), which is a home emergency repair service solution offered by Etiqa Insurance, simply ring our dedicated 24-hour hotline at +65 6702 2662, and this superhero will dive in to save the day. While he may not be able to shrink or expand in size, this skilled tradesman can use his tools to plug up the leak in a jiffy, no matter how big or small it may be. They say only the worthy is capable of wielding the mighty voltage detector, but none is more worthy than the mighty Electrician! If you are facing a blackout due to electrical overload or other electrifying issues that prevents you from catching your next drama series, EHA is just a ring away! We will notify your local electrician to head down to your home. With his trusty tools and godly skills, he is able to resolve the matter in a flash! Home is where the heart is, especially when it’s time to get up for work. But what happens when your love nest is invaded by nasty pests? Well, you need not fret! Being covered under EHA means you are able to request for a pest control team to remove critters like rodents, termites, bees, wasps, and hornets (sorry, the Green Hornet doesn’t count). Just like the sharp-eyed superhero, Hawkeye, no pest can escape the steely-gazed sight of the pest control team when they focus on ensuring that your home is fully pest-free. An all-powerful being that travels through portals, the superhero known as the Locksmith dabbles in the mystic arts of the lock and key, and comes to aid those in their greatest time of need – when they are locked out of their own house. If you ever find yourself locked out or stuck with a broken key in the lock outside of home, you can breathe easy knowing you are covered with EHA. Like the mysterious Marvel hero, your locksmith will appear seemingly out of thin air to unlock the portal between the comforts of your home and the outside world. With Etiqa ePROTECT home insurance, you can be assured that you are protected in the event of unexpected incidents at home. What’s more, with the Emergency Home Assistance (EHA) coverage, you are covered across 4 types of emergency repairs worth up to S$4000 – allowing you and your loved ones to rest easy knowing that your local superheroes are just a phone call away. Find out more about our home insurance here! and give credits to more Superheroes! We have to agree, sometimes our domestic helpers are really superheroes in disguise. Just like the Avengers hero, they seem to have an uncanny knack for doing what they do best while juggling a myriad of tasks all at once – how else can they prepare a tasty breakfast for the children, keep the clothes cleaned and ironed, walk the dog, and keep the house in order, all while preparing for tonight’s dinner at the same time? But even superheroes need a break, and that’s where your Etiqa ePROTECT maid insurance kicks in. When your domestic helper falls ill and needs to recuperate, the policy helps to cover the hospitalisation charges incurred. On top of that, it also helps S.H.I.E.L.D you from extra costs like alternative maid services and rehiring cost too. Clunk! Your heart sinks when you hear that sound, especially when you are on the highway. It’s one of those days when your car refuses to co-operate, and you find yourself coming to a slow rolling halt. In the middle of the highway. And that’s where your trusty Ironman…we mean mechanic, swoops in to save the day. With your personal Private Car Insurance or ePROTECT motorcycle insurance at the ready, you can ring any of our Approved Reporting Centres, and a mechanic will tow your car to our authorised workshop. With a combination of mechanical experience and technology, you can trust this local superhero to patch your vehicle back to tip-top condition.